From Amazon: Sixteen-year-old Cassandra Renfield has always seen the mark—a light glow reminiscent of candlelight. The only time she pointed it out taught her she shouldn’t do it again. 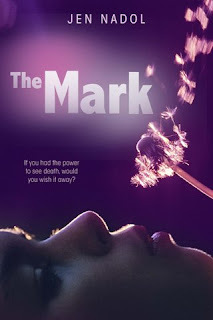 For years, the mark has followed Cassie, its rare appearances odd, but insignificant. Until the day she watches a man die. As she revisits each occurrence of the mark, Cassie realizes she can see a person’s imminent death. Not how or where, only when: today. Now armed with a slight understanding of the mark, Cassie begins to search for it. Even as she hides her secret, Cassie mines her philosophy class, her memories, and even her new boyfriend for answers about the faint glowing mark. But many questions remain. How does it work? Why her? And finally, the most important of all: If you know today is someone’s last, should you tell them?